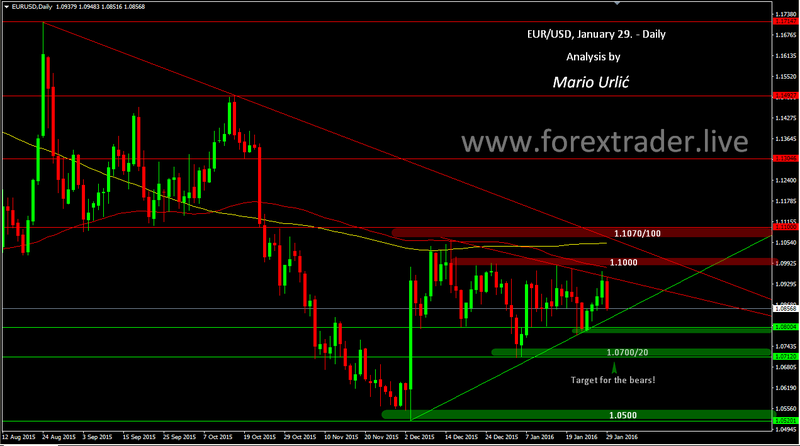 EUR/USD, bulls VS bears 1:1! US GDP lower, US dollar stronger. Well, it’s not a surprise, I wrote yesterday that the battle between buyers and sellers here is strong and bears strikes back today. The pair reached my predicted down trend line yesterday with high of the 1.0967, after wich the sellers took over today, pushing strongly down toward 1.0800. Possible target for the sellers could be 1.0700, I doubt that they will be satisfied if they don’t reach that level. First support is trendline at 1.0820/25, then comes 1.0780/800, after wich the buyers could retreet lower! US dollar is too strong for now!